Guess what came out in 1997 and is still in print? The fabulous Welcome to the North Pole from Piece o’ Cake! This is one of my personal favorite books. I got it when it first came out and it sits on my bookshelf to this day. Back when I first got it, I made a little project for my friend’s parents, and loved every minute. I jumped at the chance to get an additional review copy from Martingale / That Patchwork Place. 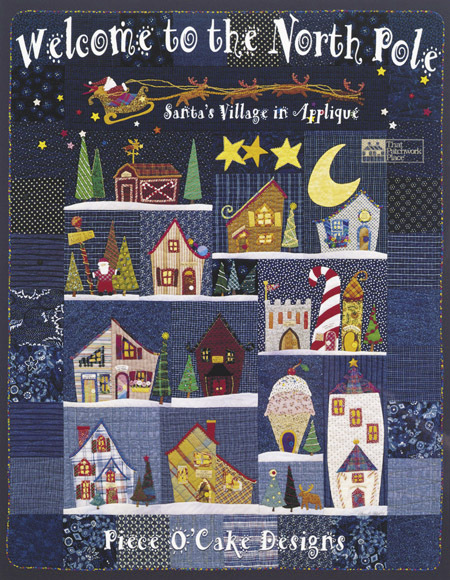 The scenes in this book, which is subtitled Santa’s Village in Appliqué, are just utterly whimsical and charming. Here are a couple of the vignettes from Santa’s Village. The book includes notes on fabric selection and preparation, information on the Piece o’ Cake gals’ hand appliqué methods, adding embellishments, and finishing your festive little quilts. If you’d like a chance to win Welcome to the North Pole, leave a comment here on this post by 7:00 p.m. California time on Sunday, September 4. Drawing open to U.S. and Canada addresses only. Remember that if you’re subscribed by email, you’ll need to click on the title and come over to the blog itself to leave your comment. I just love Piece O Cake designs…this one has been on my wishlist for a while. Thanks for doing a giveaway. Thanks for the great giveaway! I’d love to win! Oh how fun!! I’ve looked at that book on the Piece O’Cake site, and always think, I’d like to make something from that book. Maybe I’ll win and actually get to do it! Thanks, Kay, for the opportunity! That is too cute! Love the ice cream cone “house!” Thanks for the chance to win! I have a special place in my heart for piece o’cake designs. Would be nice to win this classic. Piece O cake is doing a couple of workshops in my area this month. Can’t wait!!! Great post and give-away! What a wonderful and fun book. Something to work on for next Christmas. So cute! How did I miss this book? I would love to win this and make it. I love Piece O Cake and their designs. Thanks for the chance to win. I would love to win this book, I tried to get it from our library and it seems to be lost, so guess someone walked off with it. It’s sew nice to see a book on the market, still being printed after so many years. The pictures remind me of my ‘Rudolph’ book that I had as a child (at least a hundred years ago!). What fun it would be to make the applique in that book! Thanks for a chance to win a copy. What a fun book. Thank you for giving us a chance to win a copy. Crossing my fingers. Oh, I love anything with a Christmas theme. What a wonderful book. I have seen this quilt at a number of shows. Thanks for sharing. I Love this book – and it looks like the author or someone used plaid shirts for the background for the village! What fun! Thank you for this offer! OMG!! I live and breathe CHRISTMAS!! I would sooo love the win a copy of this book!!!! Thank you for the opportunity!! What a cute little book. I’d love to win this one! I would love to make some of these for friends. This has been a favorite and on my wishlist for a long time, too! Thanks for the giveaway. I LOVE, LOVE, LOVE to machine applique!!! I’d love a chance to make a wall hanging from this book. Looks like a wonderful book and all of the blocks are so cute! Thanks for the opportunity to enter your giveaway!! Becky Goldsmith and Linda Jenkins are two legends in the quilting world. I follow Becky’s blog and LOVE their designs. I would love to have their classic Christmas book. Thx for the chance to win. LOVE your blog too. I’ve never seen this book around here and I’ve been to every quilt shop within two hundred kilometers. I’d love to have it, it looks like so much fun! What a neat book! Would love to win it. I’ve been a fan of Piece O Cake Designs and was amazed when I watched them on Alex Anderson TV show and how that made such tiny appliques and their designs are wonderful. I would like to win this book. Thanks for the reminder about this book being available, in case I don’t win. What a fun book. It looks like it has a lot of great projects and Christmas is just around the corner. I love the quilt. It would be a fun one to make. Thanks for the opportunity to win the book. I love the designs and thanks for the opportunity to win the book. I have had my eye on this book for a long time. I love the vintage feel their designs have. It sure is fun to be talking about winter projects. I’d love to win this book – thinking about doing it with wool and cotton – wouldn’t that be cool? Love Piece o’ cake designs. I love Piece o’Cake designs! I took a class from Becky Goldsmith-she is the best teacher I have ever had! I don’t know how I missed seeing this! 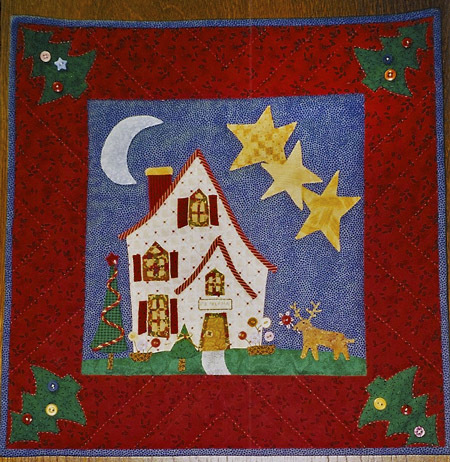 I am a Christmas junkie and most of the quilts I have made are Christmas themed. I would love to have this book to add to my collection. 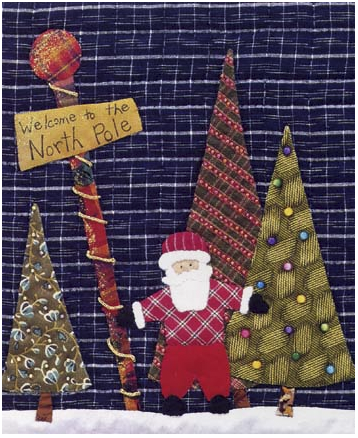 As I am getting more and more into applique, I would love to add an applique Christmas quilt to the pieced quilt line-up. Thanks for bringing this to our attention. Wow, what a beautiful wall hanging! What a great gift! I would love to win I love Xmas and have actually been to North Pole AK before! It’s so cute. All the poles are painted to look like candy canes. I would live to win this book! Kay, your little quilts are just wonderful. I love love love love Christmas, Christmas Season, Christmas tree’s, Christmas lights, Christmas spirit, Christmas colors, Christmas gifts, Christmas Christmas Christmas Christmas……quilting…..
What whimsical patterns. They are so cute. I would love to make this as gifts for my loved ones. You can make the entire quilt or just cute wall hangings. Thanks for bringing us a Blast from the Past. I would love to win this book! The Piece O’ Cake gals are just soooo very talented. I love just about everything they put together! How beautiful! With a soon-to-be one year old granddaughter, I’ve been thinking of things to make for her for the holidays. Thanks for a chance to win such a delightful book. I already feel so inspired. Kay thank you for the chance. I would love to win this book. I love Piece o’ Cake designs and this book looks like it would be a lot of fun! Thanks for the chance to win a copy! I love Christmas Appliques and would love to win your book. I have several of her other books; this would be a great one to add to my collection! I love applique no matter the subject. Thanks for the offer to win a fun book. I love this book and have other Piece O’Cake books. I have seen it before. I have also meet Becky at Empty Spools and she is a lovely peroson. I would love to add it to my collection. I have always LOVED this book, and love your idea of doing small projects from it! Thanks for the chance to win it. I had no idea it was still in print! 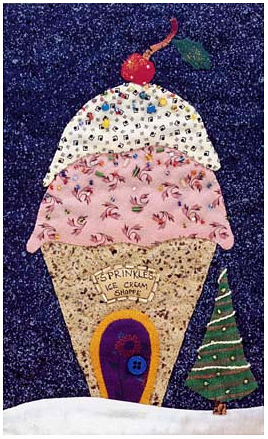 I’ve seen this quilt numerous times on various blogs and in my quilt contests. It is fabulous. I love Christmas anything! This would be a great tree skirt. Upps…I see I’m a little late to post.